Tristan is here! He was born on February 9, 2010. After 18 hours of labor, he was delivered at 9:45am, by c-section. His lung collapsed when he was delivered, and he was whisked to the sick nursery at St. Mary's. They put him under a bubble that gave him oxygen. 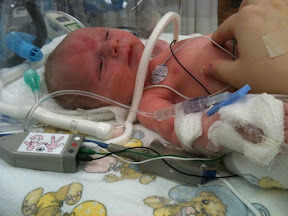 He also had to wear a cpap mask for a while, but he fought it SO hard. You can see the IV in his hand. The IV was the worst part. He tried to pull it out for days. The last night they moved the IV to his head because he had pulled it so hard it leaked. He's such a good baby. 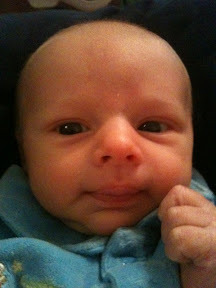 The only time he cries is when his stomach bothers him, which seems to be more frequent : (. I stopped eating dairy to hopefully help his stomach, but it's been since Wednesday and there has been no effect. If anything, it is getting worse. He cries and screams and stretches as hard as he can, but there's no relief until he gets it out. I love the MUG SHOT! He is such a peanut.